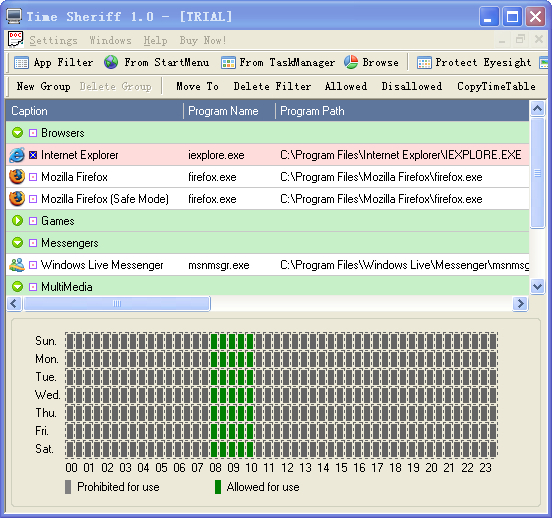 IMonitor TimeSheriff 1.03 - Download Win Apps. IMonitor Time Sheriff is a computer time control software..
IMonitor Time Sheriff is a computer time control software and parental control software for parents and small business. It allows you to set individual time limits for each application, e.g. allow your kids 2 hours/day of gaming. Or, completely prohibit the use of certain programs. It also can force kids to take short breaks in computer work to relax the eyes. A simple program, which allows to protect your computer against unwanted use. When the computer is locked by the it software, nobody can access documents on your computer, run programs, browse on the internet, etc. Transcendent award-winning parental control software, it gives You an ability to manage exactly what, when and how long other user can do on the computer. It offers adjusted powerful tools combining with user-friendly multilingual interface.